Since my last garden update, it has rapidly moved from feeling like spring in the garden to feeling like the beginning of summer. When the snap peas started to peter out, I pulled them out to make room for the tomato plants that I had started inside. I planted cucumber seeds a month or so ago and they are growing heartily, as you can see in the photo above - they look like they will have their first flowers soon and so hopefully we will have cukes in a few weeks! I also planted some dill which should be useful if we make pickles again. I started three types of cherry tomatoes from a seed packet with a variety of types (with the seeds dyed different colors so you could tell them apart). In addition to a traditional red cherry tomato and an orange one (that I am hoping is similar to a sungold, my favorite), on Lawson's request I also started a pink stripe cherry tomato (on the left in the pot above). I am curious and excited to see how that one turns out! On the left above is a volunteer tomato that came up that must be from one of the plants I grew last year, so I am also curious to see what that is - it already has a few flowers so hopefully we will find out soon. My other plants aren't as far along, because I started them pretty late this year, but they should catch up soon and hopefully this means they won't get so out of control scraggly this year. 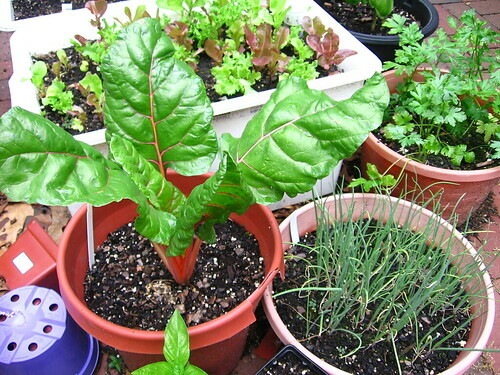 The swiss chard, (overcrowded) scallions, and parsley are all coming along well. 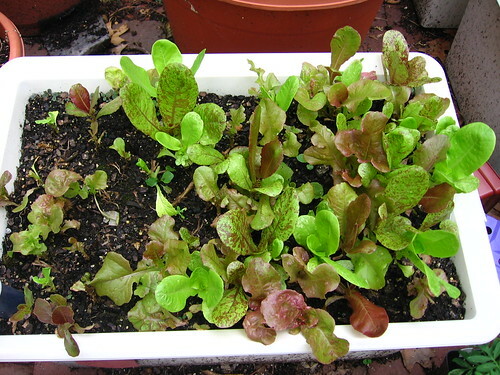 At the back of this photo and in the photo below, you can see that the cut and come again lettuce has continued to regrow well (after a few rounds of cutting back). I haven't tasted it recently so I'm not sure if it is still good or starting to get bitter and bolt, I will have to cut it back soon again and see. 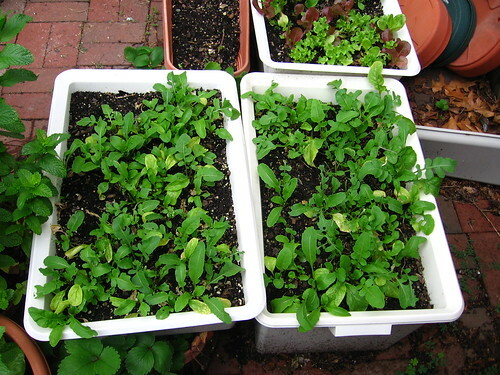 And the arugula has also grown back pretty well after I cut it back recently (which I didn't totally expect it to). How about you? 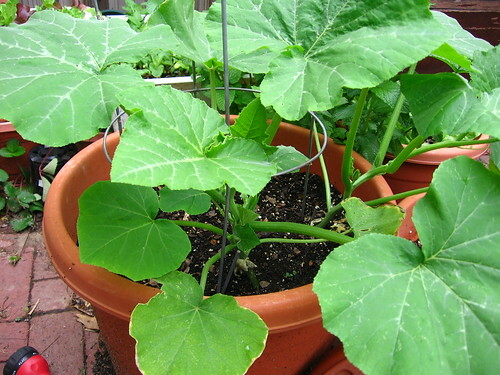 What is growing in your garden lately? Oh, it looks great! 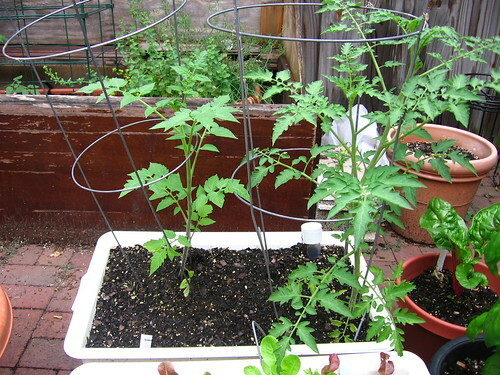 Did you use Botanical Interest seeds for the cherry tomatoes? I think I planted the same packet! I have so, so much in my garden right now, I'm going to do a garden update next week! My luck with starting from seeds was absolutely no good this year. I think I made the birds happy though. Hi Kate! 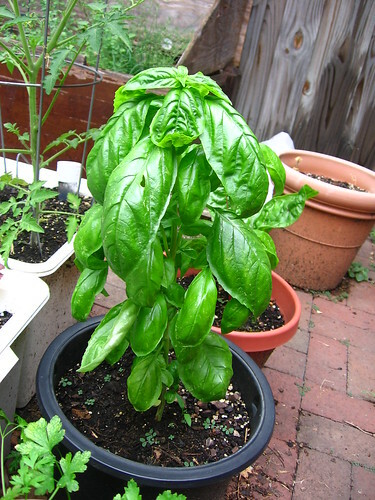 Your veggies and herbs look awesome-- they must love the heat and humidity you guys get :) I think we have a lot of overlap in the plants we're tending! I'm hoping to do a post about our garden soon, I just have found that now that it's summer, I'm spending much more time doing stuff (sewing, gardening, working, traveling) than blogging about it!